Lula is still my favourite, but i thought it would be nice to try and find some other magazines of a similar style. Whimsical, enchanting, different, feminine, and brimming with imagination, detail and shoots that you wish to step right into. Material Girl Magazine, Stella magazine, and Ballad of magazine caught my eye, they fufilled on some of the description above, and lacked on others, but all in all were worth it, though i may not continue to get each issue. Stella was my favourite for the writing content, and Material Girl for the photography...especially the shoot by Marie Zucker, who's image is also on the silver cover. I know lots of people find Lula a difficult magazine to source, so hunt no more. to see what it would be like. I can say that I'm not disappointed! styles have a lot in common too. yet still shabby chic style. of your individual style as a person. helping you with ways to alter them. printing images from an inkjet printer. But really it's all beautiful! One of my favourite projects is the fairytale lace canopy above. Wild jewellery is a book I was kindly offered to review by the publisher. It's a book by Sarah Drew about gathering and recycling, making jewellery from found treasures in nature and in things that would normally go to waste. I found the book intriguing and there's plenty to learn from the techniques shown. The majority of pieces that have been created for the book are bold in style. As you know i prefer more delicate jewellery but I can imagine its possible to adapt the ideas to fit your own style. In this post i have shared a few pages, there are lovely nature photos and clear step by step projects throughout. If you are interested in making jewellery from found objects like stones, seaglass, wood and other elements then this is a great place to begin or become re-inspired. There are tips on where best to find supplies and lots of techniques are covered including wirework, metal clay, paper bead making, making clasps, resin work and claw settings. I am offering the book as a Giveaway to one of my readers, with the only condition being you contribute postage (as it is quite heavy to post, I estimate £5) and that you live in UK (unless prepared to pay much more shipping) If you'd like it, please either email me or leave a comment telling me why you think you should receive the book. The magic of 3 by Fryd! and how much you love to share it with us freely. So full of light colour and upliftment!THANKYOU! the quote - "don't let anyone dull your sparkle" & the dreamcatcher feature! The Cygnus bookclub review dropped through my letterbox today. I always take some time out to browse the latest mind body spirit books, and the articles they share are more than just your average paragraph. They are proper excerts from the books, and you can often learn so much from these alone. It has been a real source of wisdom to me over the years of healing. Cygnus has a real friendly community vibe to it, the newsletter is free and their website also holds all the previous features to read. I have had pretty much all my life changing books from them since the nineties. The reductions in prices are second to none, and their wise, edited selection, mean you can trust you are getting books that can really make a difference. Often,the cause of a dis-ease on the physical level can be deeply held emotion, such as anger, grief, or fear. It is within us to open up to a journey that can lead us to finding this, and healing at that level can mean physical symptoms decrease or disolve. This is empowering, but we must remember to never judge another or ourselves in the unfolding on this type of work. For sometimes where the required healing lies isnt always obvious, and may not be as simple as identifying a single issue or fear and removing it with focused willpower. For the depth of any one persons healing, and the true scope of an illness cannot be seen on the surface. There are multitude of facets to anyone's life, and the reason for a condition may involve deeper purposes that either become clearer with time, or to which there isnt an explantion within that life time. I remember years ago reading Steven Levine's book,Healing into life and death, and how through his work with the terminally ill, he described how healing, in the way he had come to see it, was not just about getting better and remaining alive. For some the healing that took place in their hearts was deep and profound, it radiated out and touched others in their lives, their work in resolving their pain was complete and yet they may still have gone onto pass away. And for others they may have seemed to barely scratch the surface, they may have still had unease, and yet their condition went into remission. This outlook from someone who's wisdom was gained through direct experiences working with those who were in hospices and at the end of their life, shifted my understanding of what "to heal" really meant. And it stays with me to this day. So, with that in mind, i would say, the most appropriate steps to take are simply to believe in healing, but to not seek to define exactly what that must look like. To know that your body does have capability to heal, and that your heart and soul are always seeking to guide you in the steps you personally need to take to restore more ease at the levels you need it most. Being aware of what comes our way & feels right at any given moment. An allowing, and a non resistance to what is, combined with an "anything is possible" outllook. is to extend compassion and unconditional love. And to never have set ideas, or in other words judgements. Be open, flexible, and flow as much as possible. Ways of being that books from Cygnus have no doubt helped me in developing. a new discovery to snuggle down with under a quilt and savour the matt page the written word the sharings on bravery and so much more! I found mine here: newsstand and it came the next day. Sewing Made Simple is a book packed full of instructions and clever tips, it demystifies the subject and provides a wealth of know-how that will give you the confidence to make and customise clothes and home furnishings. It is a beautiful book, the illustrated steps are concise and clearly thought through. I feel it instills confidence in both the beginner who may not know where and how to start when sitting in front of their new sewing machine, and also those at the intermediate level of sewing, who may want to broaden their capabilities and feel ready to tackle bigger projects. The author, Tessa Evelegh, is an expert in her field with over 30 titles to her name and a previous career at the British magazine Family circle, her work has also been in Ideal Home and Homes and Gardens magazines. She learnt to sew as a child and has continued to make clothing and soft furnishings to this day. Where other sewing books i may have bought in the past focused more solely on inspiring projects, this is a real how to book, taking you through the practical sides, with pretty pastel drawings, that are easy to understand and a wealth of explanation on various topics such as types of materials to choose and how to measure for and use a pattern.Then there are some projects towards the second half of the book, for things like curatins, cushions, tablecloths and dresses. The first five chapters introduce you to all the tools, equipment and materials you will need for sewing success. ‘The Secrets of Sewing-Machine Success’ guides you around your machine and its accessories, and includes a useful section on troubleshooting. ‘Stitch Craft’ teaches you the essential hand- and machine-stitches – the building blocks of any sewing project. ‘The Paper Pattern’ explains how patterns work and how to use and adapt them for expert dressmaking. ‘Fabric Choices’ reveals how to select the most appropriate fabrics for your project, taking into account colour, pattern, composition and weave. The last chapter, ‘Basic Sewing Skills’, shows you how it’s done, with the essential techniques for making almost anything explained in plain and simple terms – from sewing on buttons and stitching darts to appliqué and piping. have also kindly offered one as a giveaway to Secrets readers who live in the UK. and i will use a random number generator to pick a winner. These images are just childhood at it's sweetest.So full of innocence, simplicity and time spent outdoors in nature. They are from within the pages of beautiful Babiekins. An online magazine that's free to browse. Full of delightful finds for children and stunning photo shoots like this one. Enjoy! Homespun style by Selina Lake! my copy arrived today, i know so many of us have been excitedly awaiting its publishing! And i have to say i am just finding it amazingly wonderful in every way! 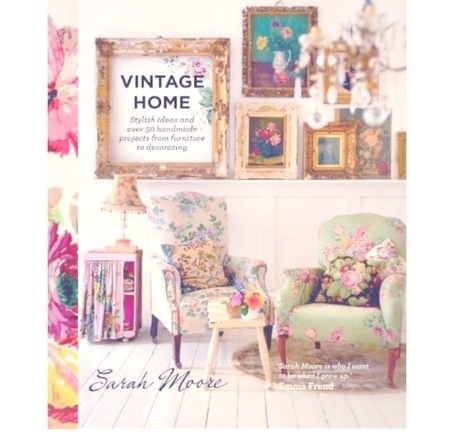 Packed full of the homemade and pre-loved, this book is a treasure trove for those who have a passion for the restored & reinvented, or who seek to add their own creativity to furnishing, through a love of crafting, painting,or stitching. of fresh colour combinations and unique one-off finds. Just as i like it! We can take a look inside the rooms of some beautiful homes from various countries, all brimming with individuality and design ideas to inspire. With photographs taken by Debi Treloar, that are full of soulful colour combined with Selina's expert styling and attention to all important little details, the result is a book showcasing a style of decor that feels full of light, colour, the lovingly handmade and a freedom of expression that's not always apparent in other ways of decorating. By this I mean, the style is more about living with what speaks to your heart and enjoying it, than creating a look to impress or live up to. I was particulary looking forward to seeing the homes of friends and people i recognise from my online world, such as the lovely Jasna & lovely Jeanette from Fryd & Design. This book brings together so much of what lifts my heart, about filling a home with what you love. Decorating is always a balance when dealing with repurposing of vintage pieces and adding such an eclectic mix into one home, it could lose identity, instead of enhancing personality. But here we are shown how to add the homespun look in ways that create just the right feel within modern day rooms, and how recycling and reinventing the old, doesnt have to have the sense of being outdated. It can instead create an entirely fresh, yet at the same time comforting feel to our homes, with the added colour of soulfulness and happiness, that really only handcrafted or customised pieces can truly bring. Selina is an expert tour guide, we can follow her umbrella (which i imagine is neon pink and floral & oh so very pretty) above the crowd within this Homespun World of wonder and never feel lost!